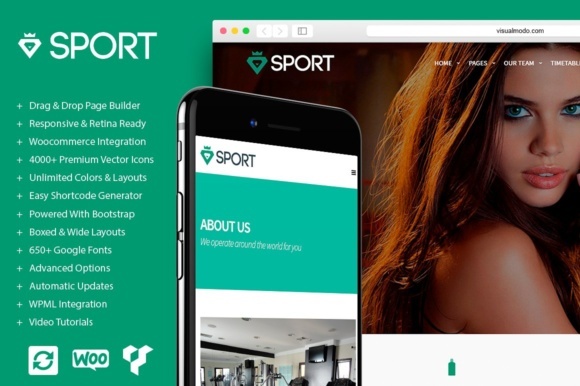 Sport WordPress Theme – A premium WordPress theme specially developed for sportive site styles, if you want to build a gym. health. fitness, sports team or any other sports site style it’s the right theme for you! Sport theme is a clean, modern, minimal, royal, multi-purpose and One-Page Sportive WordPress Theme. It has a wide range of incredible features and includes $150 worth of goodies, everything you need to create an awesome site in an incredibly easy way saving money and time doing it. Build any fitness or health site design without code knowledge! Slider Revolution – Sport WordPress theme not only supports but includes the premium Slider Revolution plugin (a $25 value) for free along with your purchase of the theme. Easily create and manage unique slideshows with captivating transitions and animations that are all completely responsive. With SPORT, you can easily include a slider on any page with the best slider plugin. A REAL Theme for your online store / shop! – SPORT is ready as an eCommerce platform, having built-in styles for WooCommerce plugin, which at this moment empowered ~30% of the world online stores!! but we take it to the next level!! Currently, inside Sport WordPress theme, we added 3 different store landing pages and refreshed the overall feel and layout, but we’re planning to continuously release new niched demos and entirely new styles – Periodically try dropping a visit, you’re more than welcome! SPORT also have it’s own advanced custom style for your cart / account and checkout WooCommerce pages to make your store look amazing and user-friendly for your costumers! Make sure all your shop clients will love to purchase your products/services once your shop is powered by our theme store framework. Updates – Our first priority is to keep Sport WordPress theme on the top and working perfectly, and our team is quick to address bug fixes as well as adding new features to the theme. You can update rare theme using our auto-updater 1-click system. Timetable Responsive Schedule For WordPress – Is a powerful and easy-to-use schedule plugin for WordPress. It will help you to create a timetable view of your events in minutes. It is perfect for gym classes, school or kindergarten classes, medical departments, nightclubs, lesson plans, meal plans etc. It comes with Events Manager, Event Occurrences Shortcode, Timetable Shortcode Generator and Upcoming Events Widget. You gain this plugin ($25 value) for free purchasing the SPORT WordPress theme. Smart Loader – Unlike other WordPress frameworks and page builders, ZENITH is doing its best to load only the necessary resources that you page needs. This will make your website super fast.